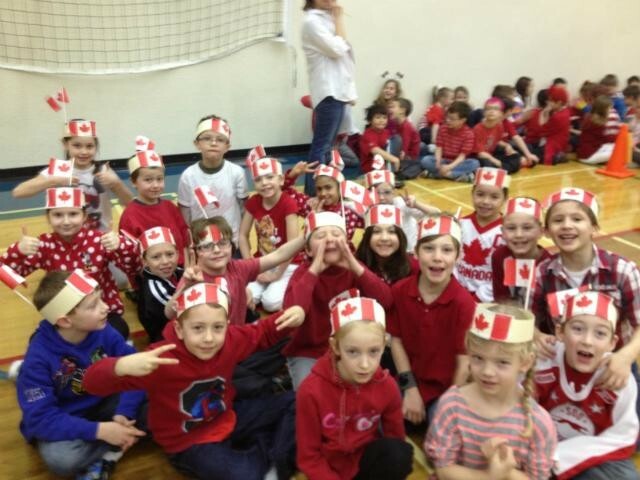 Students at École Père Kenneth Kearns participate in many cultural activities and celebrate many of the national days throughout the school year. Students receive a strong academic foundation as well as a strong cultural education in order to become responsible citizens. This can be found under the About tab - Bell Schedule. We have a French/English library at our school. It has many various books at many different levels of reading in both French and English. We also have an online catalog to look for books. Parents are welcome to come and borrow books from our library for extra reading. The bank will be open alternating Tuesdays at lunch for students to open accounts (pick up application forms from Mme Hayden at anytime) or to deposit money. Our ÉPK senior students have opened a bank at ÉPK through ATB Financial. It's a small-scale bank, operated by grade 4 students and modelled after the ATB Financial Institution. Students have named the branch, and are now responsible for its management and operations (under the guidance and supervision from an ATB team member and Mme Hayden). Junior ATB will open alternating Tuesdays, accepting deposits from students that are held in real ATB accounts. Students occupy various bank positions including greeters and tellers, as well as a Board of Directors that includes a CEO, Treasurer, Marketing Manager and more. The program teaches children the value of saving money in a practical, yet fun way. Your child will not only build their own savings but also gain many practical skills like public speaking, accountability, customer service, respecting privacy and marketing. Since 2009, the Junior ATB Program has taught financial knowledge and life skills to elementary students within the walls of their own schools. The Junior ATB branch introduces students to the basics of money management and financial literacy as they create their specific savings plan and goals. By working together as a team, students will learn the value of being a trustworthy employee and working together, while enjoying the rewards of running their own business. As Pope Francis models for us, we at ÉPK as an extension of our church, strive to ensure all students feel welcomed, loved and included. In addition to our Student Leadership Team, we also have an Inclusive Student Group available for any students who may feel isolated or overwhelmed with feeling alone. Please call Mme MacPherson at the school for more information. We are now into year three of École Père Kenneth Kearns. Throughout this year we will continue to collaboratively build and refine our identity. School Policies as stated in the front of student agendas. Including, but not limited to, information on Emergency School Closures, Codes of Conduct, Food Alergies, Absences, and expectations of Student Behaviour. Fresh air and free play time are essential breaks for successful learning. Students will have normal outdoor recesses to a windchill of -22 degrees Celsius. With windchill factors of -23 to -27 degrees Celsius, students will have outdoor recess, and the duration outdoor will be reduced. When windchill factors are -28 degrees Celsius or lower, students will remain indoors. Parents, thank you for your awareness of these practices and supporting the importance of outdoor fresh air free play. Merci for ensuring that children attend school dressed appropriately with warm mittens, hats, snow pants, winter jackets, boots and scarves. Let it snow! Let it snow! Let it snow! This is why recess matters in winter too! Kids who spend more time outside are less sick then kids stuck inside. Outside is quieter and not as nosy as inside; reducing the stress level for children. Being active outside in active play gives children exercise. Preventing Nature Deficit-Disorder; spending time outside connects children with the outside world. Kids who spend time outside in fresh air sleep better; better sleep makes better students.